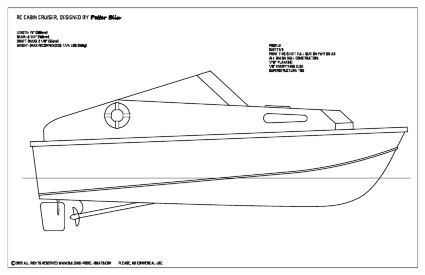 Model Boat Plans Store - Download Blueprints for Your Next Ship Model Here! CAD generated and lofted and/or large-scale scanned and electronically cleaned up. 30 day, 100% Satisfaction Guarantee. Never folded, no shipping, no hassle! Here is a list of my small, but growing collection of high-quality model boat plans. Please have a look! 1. 1:32 and 1:24 in a single zip file. Each consist of two sheets in PDF format. Find out more here. 2. 1:16 ***NEW*** Giant scale on three 36" x 72" sheets. Read more here. For prospective buyers outside the USA: Make sure you have a printer who can handle the paper size!! They are based on the RC PT boat that I was building, inspired by the old Lindberg kit I had as a teenager. All three are essentially the same design, only in three different sizes. Click the links above for more information. 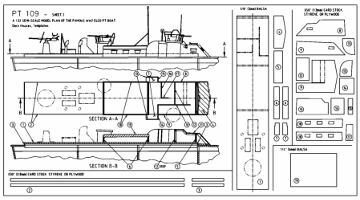 PT boat model boat plans - click image for more information. This is the first sheet with hull templates and GA.
1:16 scale in a single zip file. 1:24 and 1:32 scale in a single zip file. If you're new to model boat building from scratch or just want something easy, try this one. It shares a similar easy-to-build hull construction as the PT boat, but is actually even easier to build. The boat measures 15 inches long finished and weigh just over a pound (about half a kilo). The size was kept small to facilitate printing onto relatively common paper size. The plan is laid out with all templates on five 11x17 size sheets and the bulkheads and other templates on two 8 1/2 x 11. The plan can also be printed on ISO-sized paper (A3 & A4). Click the heading or image above for more information. This is a real bargain. Seven sheets semi-scale plan in a single zip file. Model ship plan of the first Confederate ironclad AKA Merrimack (or sometimes incorrectly Merrimac). I spent many months researching the vessel and this plan is the result. 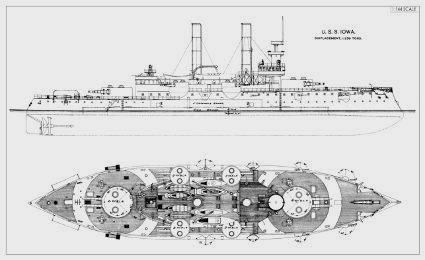 CSS Virginia plans - click image for more information. The plans show no model construction, but is rather a representation of the real ship as she would have appeared just before the battle at Hampton Roads. Hull lines - full sections, buttocks and waterlines. 30-foot cutter with complete lines. 1:48 (1/4"=1') scale, one sheet 36" X 108"
1:72 (1/6"=1') scale, one sheet 36" X 60"
1:96 (1/8"=1') scale, one sheet 27" X 36"
It would seem weird to offer the CSS Virginia without the USS Monitor, so here it is. The plans come in the same scale as her nemesis, so why not get both? 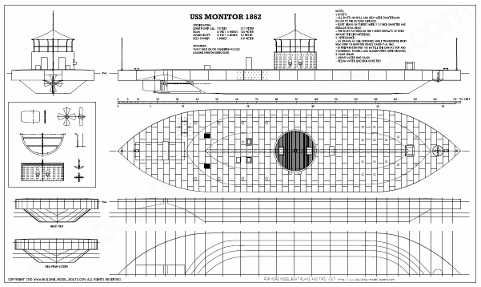 USS Monitor plans - click image for more information. Hull lines - full sections and waterlines. Rudder and Propeller arrangements etc. 1:48 (1/4"=1') scale, one sheet 36" X 61"
1:72 (1/6"=1') scale, one sheet 36" X 42"
1:96 (1/8"=1') scale, one sheet 22" X 36"
Here is a plan set for building the protected cruiser USS Olympia of Spanish-American War fame. This plan can be used for either bread-and-butter model boat construction or plank on bulkhead. Templates for each construction method is included in the plan set. You can see Roger Kreiter's model built from these plans here. 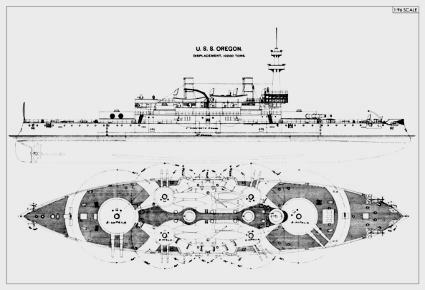 USS Olympia General Arrangements. 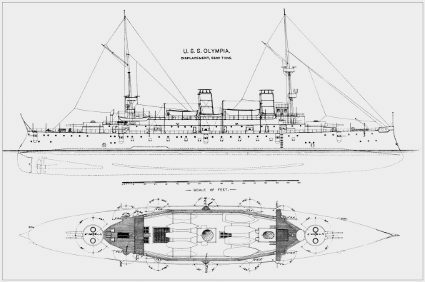 Click image for for more information about the USS Olympia Plans. A separate pdf document (8 1/2 X 11 inch) with each Section Template laid out in full. This document can also be fitted on A4 format paper. 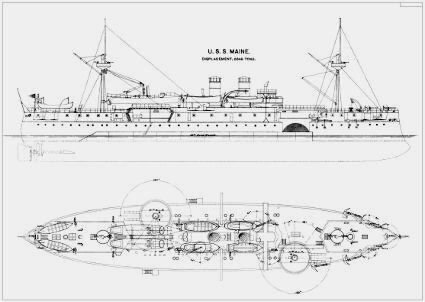 Contemporary General Arrangement Plan of the USS Maine ACR-1. Click image for more information. 46 1/2 X 33 1/2 inches. 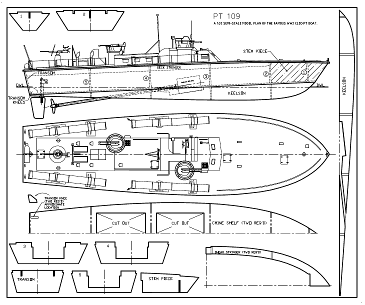 General Arrangement Plan of the USS Oregon BB-3. 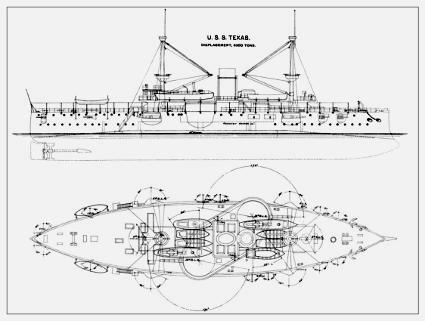 General Arrangement Plan of the USS Texas. General Arrangement Plan of the USS Iowa. The CAD generated plans are of exceptional quality, simply because they have never been printed, scanned or folded. These are the best print quality and accuracy I've ever seen in a set of model boat plans. The first time they are printed is when you take the files to your local print shop. To my knowledge, nobody else offers this service. The down-side with CAD generated plans is that, for a one-man-show, it takes a long time to generate each one of them. I've concluded that it would benefit more people to simply offer scanned plans of these historic ships. All plans are in pdf format. If there are more than a single pdf-document in the download, it comes as a Zip-file. For those files you will need a zip/unzip program to access the plans. I use jZip because it's free and reliable. Changing the scale when printing out is tricky with pdf files. I have therefore formatted each document for a single scale. Follow the link for more tips on printing pdf's further down on this page. At one point I offered the CAD generated plans in several different scales, all individually. It drove me crazy trying to keep track of it all, and try and figure some sort of price structure. I gave up and decided to offer all different scales of the same subject in a single download. It has worked out well. When you buy these model boat plans you receive a zip file containing multiple drawings at different scales. You get more flexibility in choice of scale, I get less files to track. A win-win. For any questions, feel free to use the Q&A or the contact form (link below). Have the model boat plans printed locally and save money. Click here for printing tips. Feel free to ask any questions about these plans. Use the contact form. 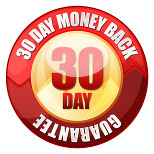 There is a 30-day, no risk, money back guarantee on all plan purchases. Click the image for more information (will open in new window). Hi There, I bought your PT Boat plans several weeks ago and I am building the 40" version. I have built the Dumas PT 109 twice over the last 30 years and I have to say that your build is unique and easier! Good Job! Thanks for the great plans. Just a note to let you know how much I enjoyed building your "Cabin Cruiser". I'm about 90% complete and look forward to 'ice-out' so that I can see how well she performs. I have scratch built many airplanes but always lacked the knowledge to build a boat. Your excellent instructions provided that needed knowledge and I now look forward to building your PT boat. This has been a real heartwarming project for me to watch my 12 year old son work on this with me. The [PT-109] Plans are great and the parts thus far have all fit like a glove. Well worth the money... You should charge more! Just writing to say that I bought and down-loaded your U.S.S. Monitor plans. They are beautifully done, the best I've ever seen of an ironclad and have inspired me to build a model of her. Took my disc to The Copy Centre this afternoon and had them printed. I was most impressed with the quality of reproduction and it looks like the size would be perfect for an RC model. I wish to thank you once again for the down-loads on two ships that I'd ordered. The down-loading was most easy to accomplish. I'm NOT a computer whiz so I was indeed happy to see the process was easy. The super-size Kinko's printout was/is great to have not only for really good, clear details but for a very nice, nearly over-whelming print to stare at. The print-outs from my own printer are equally useful for "carry around" purposes. I can grub up copy after copy as I carve out the hulls, paint, or cut out some detail that is needed. They are also very handy for note-taking as I progress on the models. I must say the cost of your down-loads was most reasonable as well. Thank you on this especially since I am retired on a fixed income. So, thank you for your product that met all my needs in this area. I've nothing at all to find fault with or complain to you about. I am completely happy with the images you provided. Learn more about printing the plans locally. Visit the Model Boat Plans Printing Page for more information (will open in new window).